When jeweller Spider Kangolo was retrenched from the gem company that employed him for several years he was devastated and thought it was the end of the world. 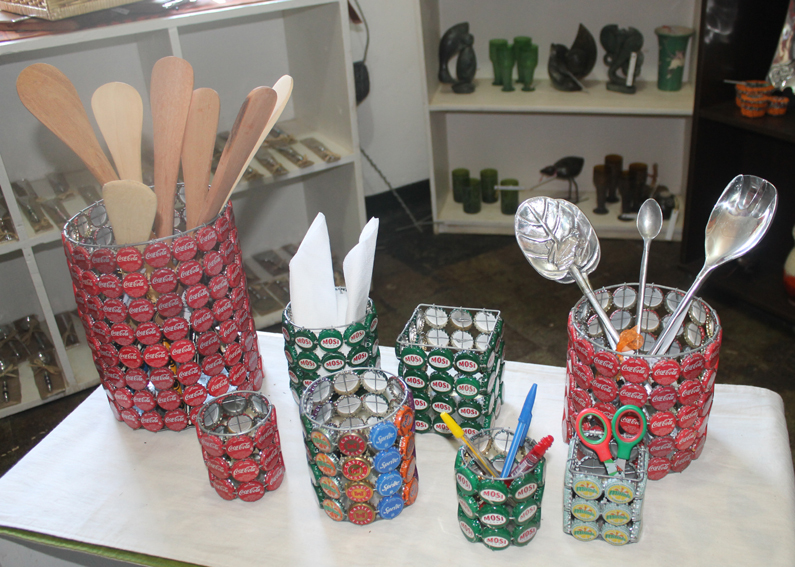 But a close friend advised him to capitalise on his creativity and the skills he had acquired. 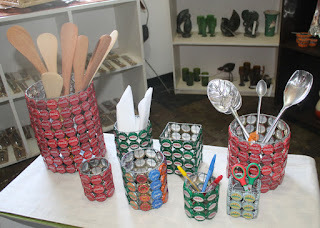 However, instead of continuing as a jeweller, seeing he did not have the capital to set up that sort of business, he took to collecting discarded bottle tops, creating them into all sorts of things from earrings to furniture and 15 years down the line he has perfected this skill and has emerged into what is almost a one man manufacturing industry. “I started in 1998 here in Lusaka this is after I came here from the Copperbelt. 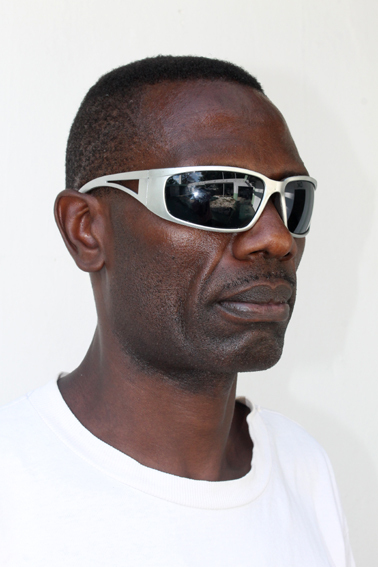 I was inspired by Quentin Allen who I used to work with on the Copperbelt when I was a jeweller. 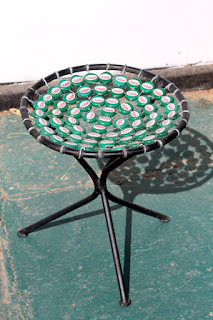 But for what I’m doing now first I started with making waste paper bins then I started making anything, hats, and chairs lamp shades”, says Kangolo who has just been on the phone with a client from Livingstone, a backpacker’s lodge that ordered 10 lounge chairs. “All I use is soft wire, just different sizes depending on what I am making whether earrings or fruit bowls and so on. The designs are also my own, I sketch them first and take these to a welder who does my frames when I’m doing furniture like bar stools which are the most popular”, he says. He explains that he sells the bar stools for K200 but some of his clients that get them on wholesale are known to sell them for about double the price but this does not bother him. “Business like any other has its ups and downs but yes otherwise I’m used I am managing. In the crafts market September and October is quite bad, but by the end of this month and up to December it is good because people start buying gifts for Christmas and the end of year,” he explains. 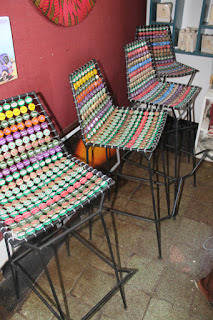 “But I also want to expand into something big because I don’t think I can manage the orders alone if you look at what happened recently someone just approached me to do 40 chairs and I spend about 4 hours on one bar stool and every bar stool takes about 220 bottle tops, so it is a lot of work and sometimes I work around the clock,” says Kangolo. 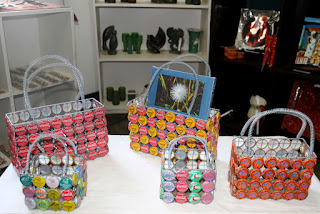 Kangolo has not invented the use of bottle tops for use in crafts at all but he has taken it to another level making very high quality products and raising standards. Although this kind of craft is common in South Africa and Zimbabwe, he appears to be the only one doing it consistently and so skilfully in Zambia which is why he is getting commissions from as far as Livingstone. One can only hope he manages to expand his workshop and further train his apprentices so that his company can grow and he can probably employ more youths helping to contribute towards job creation and poverty reduction. 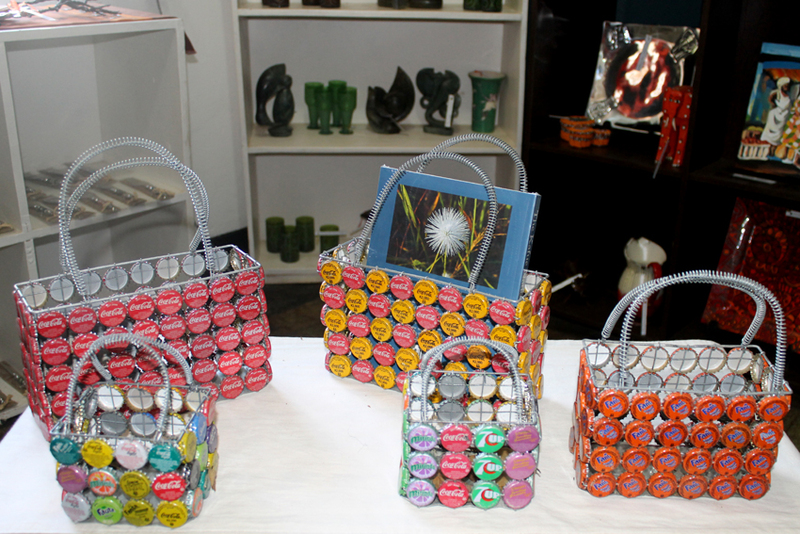 His earrings, pen holders, bar stools and basket handbags can all be purchased from selected craft outlets such as Ababa House on Addis Ababa Road, the Art Academy without Walls in the Lusaka showgrounds from where he sometimes operates or the Sunday market at Arcades, and since it is that time of the year, why not visit one of these places and surprise a friend, or loved one with something unusually Zambian. 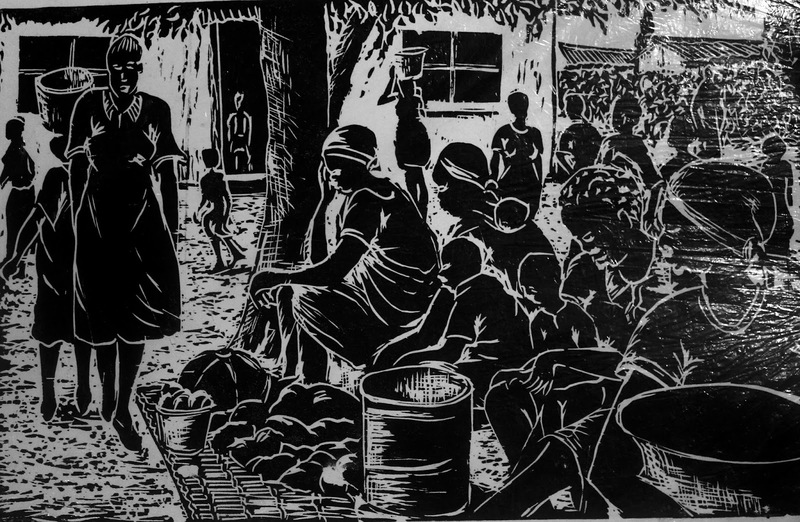 There are a few artists in Zambia that can boast the consistency of David Chibwe, a painter and printmaker that has been active on the Lusaka art scene for well over 40 years, surviving on nothing but the coaching and production of art alone. As focused and uninterrupted as his illustrious career may appear, it started on a rather flippant note when in 1970 as a teenager he left his parents’ home in Lubumbashi, Congo where his father, a Zambian missionary lived for many years. “When I left the Congo I never went to see my relatives in Zambia, it was an adventure I didn’t even have money for transport but my friend sponsored me. We arrived in Ndola and were supposed to catch a train to Lusaka, by then it was 1 kwacha 18 ngwee per passenger but we only had 2 kwacha,” he recalls. Luckily Chibwe had a box of watercolours, then they stumbled upon Kingston’s, a popular stationary shop at the time, seeing the array of brushes, tubes and paper, the excited youths decided to invest. “I told my friend let’s use the little money we had, when I convinced him we bought assorted material, and went to sit in the park next to the museum, we sat on the benches and I started making small abstract paintings, it was just after new year we were very young and a bit hung-over from a late night,” he recollects wearing a mischievous smile. 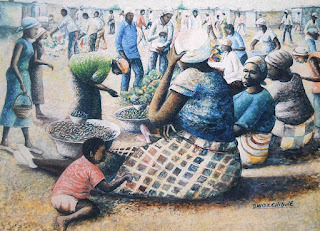 “We sold my paintings for two kwacha each, then we went to Savoy Hotel, I sat outside and started making some more, my friend was doing the selling and we ended up making over 30 kwacha which was a lot of money, we were still in the New Year mood so we went to a bar called the Under Tavern at Broadway”. Having had their fun, the lads eventually managed to catch the train. When he got to Lusaka, Chibwe was able to locate his sister’s friend in Kamwala who took him in. He wasted no time and started selling, his paintings in Madras and Long acres. Democratic Republic of Congo in 1969. He was clearly a cut above the rest. “When Henry Tayali came back from studies in Germany, Mr Manda introduced me. Also Mr Tayali told me that the cultural village was no place for me,” he says. 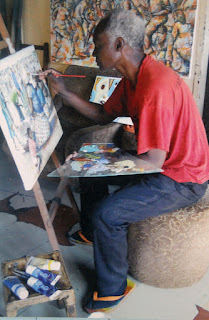 It is Tayali who introduced him to the Art Centre Foundation (ACF) at the Evelyn Hone College, where he started working with Patrick Mweemba and Fackson Kulya until they were joined by the Choma-based, Dutch artist Bert Witkamp, Style Kunda and the youngest member of the group Vincentio Phiri. In fact in its day, under the leadership of Cynthia Zukas MBE and the late Bente Lorenz, the ACF was so organized it would host discussions every Thursday where they would invite and engage non-artists and key members of society. “We would just sit and talk about art, we even used to invite people like medical doctors and lawyers, so one doctor even gave us a contract to decorate the children’s wing at the University Teaching Hospital when we convinced him that art is therapeutic,” remembers the artist. 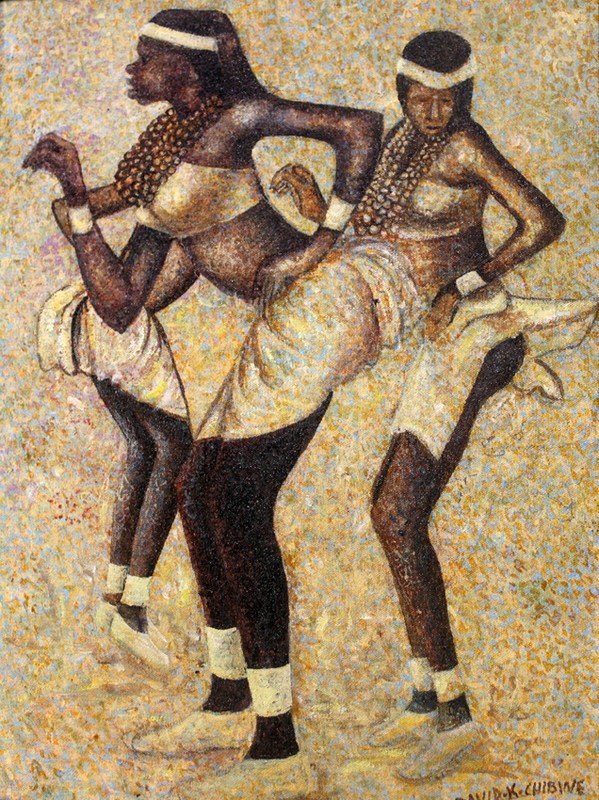 Chibwe would later become a founder member of the Lusaka Artists Group which was operating under the Art Centre Foundation, but he explains the group was short lived because it was like having an organisation within an organisation. 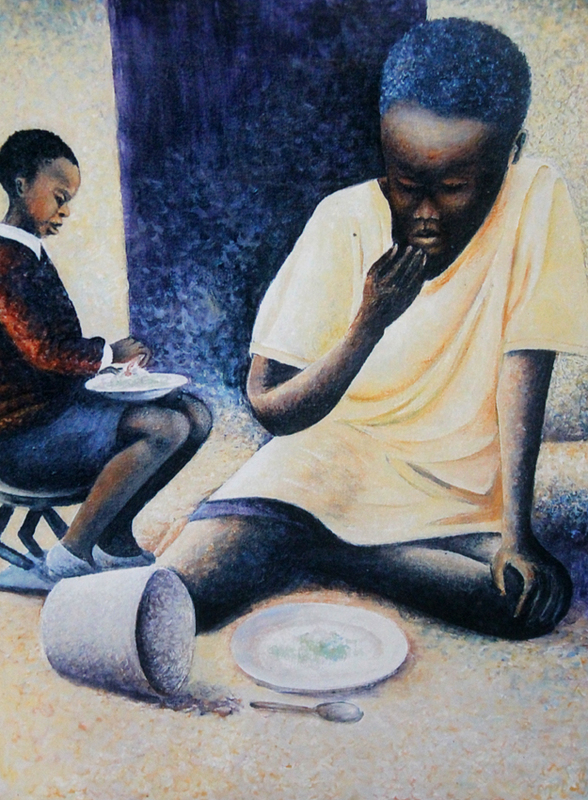 He remembers the late 1970s and the early 1980s as being the golden age of art collection in Zambia; these are the days of the defunct Mpapa Gallery founded by Joan Piltcher with Heather Montgomery, Ruth Bush, Gwenda Chongwe and Zukas as board members. “Mpapa Gallery were very strict and they did not just display anyone or anything, it is not like nowadays at the Visual Arts Council where the gallery is just showing anything,” he declares taking a swipe at the VAC run Henry Tayali Gallery in the Lusaka show grounds. “In the 80s there was also an Indian who came to the Evelyn Hone College, he is the one who thought of commercialising the artists workshop he thought we should do silk screen, so we went to Lumumba Road and from there we started printing seed bags for Zamseed, but this guy was also a drug dealer he ended up being arrested at Bombay airport and the project died,” he adds. From his tales in the 1980s he also suggests that when there was a change of government at the turn of the decade those who came into power were simply not interested in art and this was a serious downturn. “When the new president and cabinet do not appreciate art then that’s the end, there are very few Zambian ministers or even businessmen that can buy a painting from you today, not even for K1, 000 (one thousand kwacha) when you tell them the price they say ah! Even prominent black buyers like Mr Kapotwe it is just because he worked with Mr Sardanis for a very long time”, he alleges. 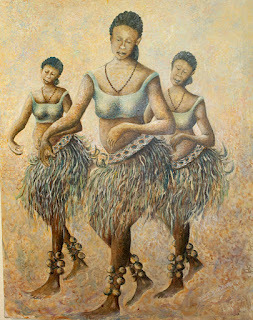 For the most part, Chibwe has had a very illustrious career, enjoying significant commissions over the years. 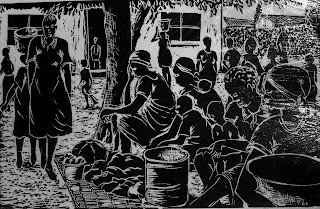 His linocut prints and paintings have been collected all over the world. Perhaps in the evening of his career, he now intends to retire to a small holding in Chongwe where he will teach and produce art, known for knocking from door to door seeking funding for the project proposal intended for an art village he tends to build there. It is sad to note however, that something does not add up, at 66 he appears to be older than he should; he is clearly stretching himself to make ends meet as well as get his project going. One feels he could have done better for himself than wait until he is not getting any younger and visibly weary, but such is life. Unlike many western countries that have retirement packages for aging artists, this is far from being a reality in Zambia. Nevertheless, Chibwe remains a maestro, one of the Zambian greats his rhythmic brushstrokes still blend perfectly with his musical subject matter as can be seen in the paintings Akalela Dance and Dance to the Rhythm. The soft colour palette and mildly blurred visual effects that lend the artist his signature style will continue to charm us for ages. He lives and works from his home in Kaunda Square stage 1.